For many of us, apartment living isn’t unusual. In the past 12 months almost exactly, I’ve had 4 different residences. I’m so glad to finally be settled in this very apartment for at least the next 8 months, and hopefully fate allows for me to re-sign and establish my roots, even if only for a little while. But I’ve become adept at making my living space feel as much like home as possible, so I thought I’d share some tips with those of you in similar situations. Homemade and colorful touches, like my flowers made from plastic bags, go a long way. Keep things tidy and close at hand, so you don’t have to dig to find them. Plants plants plants. Plants make everything better. Again, simplicity and handmade as much as possible, make for a comforting home. Keep it simple. Save things that are important to you (like the bouquet I caught at my friend’s wedding), but don’t overdo the clutter. Carefully sift through your sentimental possessions and only keep the ones that mean the most or serve a strong purpose. My rule: is it useful? Is it beautiful? If it’s neither, I toss it or donate it for someone else to enjoy. This means that I’ve done away with quite a few sentimental possessions, but I’m surprised to say that I don’t miss them. Handmade increases the comfort factor. If you or someone you love creates anything by hand, try incorporating those elements before purchasing anything from a store. While you can get nice, clean prints online and at big box stores, nothing adds personality like a completely unique piece of artwork. If you’re not crafty, try checking out Etsy and supporting some small-time artists. If you’re thrifty, you can find some pretty sweet (and pretty terrible) pieces of art at Goodwill. Last time I was there I saw a portrait of someone’s two young sons for sale. Just don’t be that creepy. Keep it visible. This feeds in to point #1. Try to keep most of your possessions visible and not hidden away in drawers stuffed to the brim with random trinkets (read: junk drawers. I still have way too many of these). This effect is twofold: you become aware of all the junk you really have and can get rid of some, and you also spend much less time seeking out things you need. Keeping things visible and reachable makes it feel less like you’re living out of boxes and more like you and your possessions have an established home. Plants help more than you’d think. Having plants (and even plastic flowers I’ve gathered along the way) helps liven up my apartment. They give me another life form to consider each day. I recommend Wandering Jews, pothos or Aloe plants. I’ve had these three types of plants for years, and have yet to see one wither away under my care. Skip the frozen and boxed meals. These aren’t all that comforting. Putting together a meal yourself, even if you do break out the frozen veggies, is worth the small time invested. Chicken noodle soup, an easy go-to meal, takes 30 minutes to make, travels to work well, and is inexpensive depending on your preferred ingredients. I also find that spending time in my kitchen makes me feel at home and in control. NOTE: this doesn’t mean you can’t cook up a box of macaroni and cheese and sit in your comfy pants on the couch watching Netflix all night consuming the whole thing. Do this sparingly, but do what makes you the most comfortable. Overall, I’ve learned that keeping a clean apartment helps more than anything. For me, coming home to clutter or timothy hay all over the floor (thanks, bunnies) triggers my stress reaction. My reaction is just to get rid of as much clutter as I can to avoid that reaction. What do you do to make yourself feel at home in a temporary place? 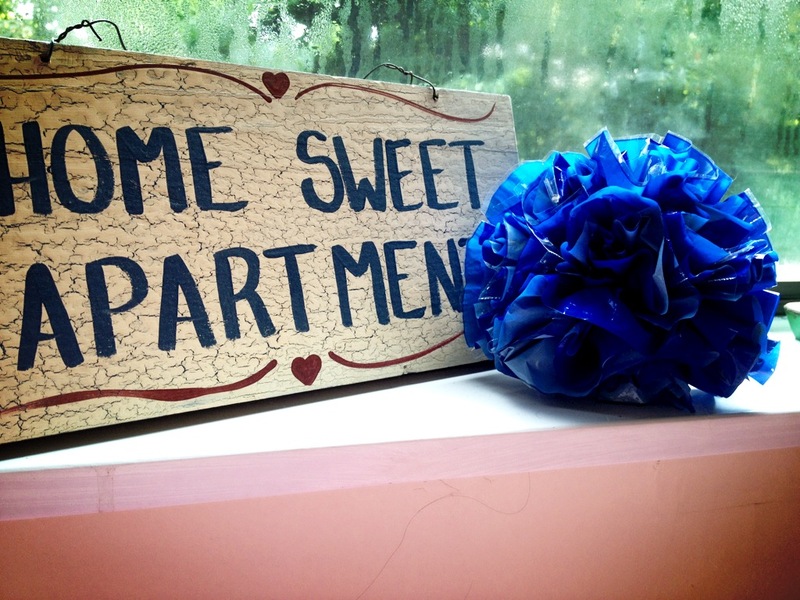 This entry was posted in Home and tagged apartment living, declutter, get rid of stuff, home, homesickness, simplify. Bookmark the permalink. Aaargh! Wandering Jew! I live in New Zealand and it is a complete pest there, it gets everywhere and because there is no frost it never dies. And dogs are allergic to it. I used to have one too as a houseplant but I never want to see it again!! Those Victorian English people had a lot to answer for bringing it to NZ! Oh my! I can totally see where it’s invasive – I couldn’t kill these plants even if I tried. That’s good to know, because someday I want to get a dog, I’ll just make sure to keep it out of reach!